The Mormon Church was founded in New York after Joseph Smith, Jr. claimed to have found a buried book of golden plates written by ancient American prophets in the late 1820’s. Smith said the Angel Moroni, who was the guardian of these plates, had directed him to these writings and that his mission was to publish a translation of this book. 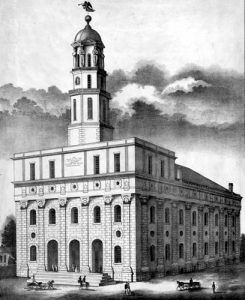 This work, published in 1830, as the Book of Mormon, served as a foundation for Smith’s organization, first called the Church of Christ, established April 6, 1830. It was later renamed Church of Jesus Christ of Latter-day Saints. For most of the 1830s, Smith lived with the majority of his church members in Kirtland, Ohio. Growing in numbers, Smith sent followers to Jackson County, Missouri, in an attempt to establish a city of Zion as the biblical New Jerusalem. Situated near Independence, the Mormon settlers were driven out of the county in 1833, then settling in Clay and Caldwell Counties of Missouri. Smith’s paramilitary campaign to redeem the area was unsuccessful. 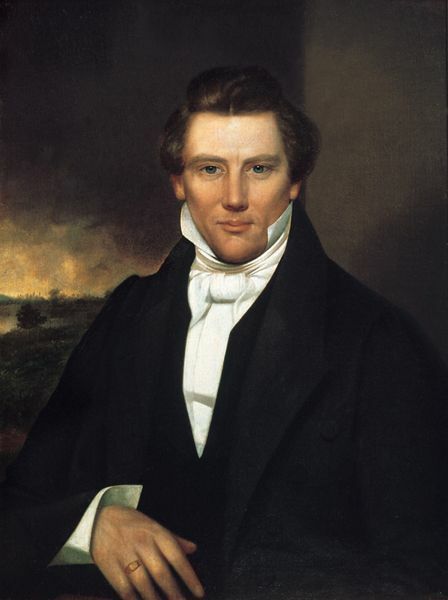 Smith then taught his followers that the church needed endowment of heavenly power before redeeming Zion, and he soon began construction of an expensive temple in Kirtland where the endowment was to occur. However, on January 12, 1838, after a financial scandal effectively caused the collapse of the Ohio church, Smith fled an arrest warrant and joined his followers in Missouri. When many of the Kirtland church members followed him to Missouri, tensions escalated with the old Missouri settlers, which led to what has become known as the Missouri Mormon War. Missouri’s “old settlers,” characterized the Mormons as fanatics whose clannish behavior made a mockery of republican institutions by placing power in the hands of a single man. Violence broke out again at an election riot in Gallatin on August 6, 1838 and before long, “old settler” mobs and Mormon paramilitary units roamed the countryside. When the Mormons attacked an authorized militia group, under the belief it was an anti-Mormon mob, Missouri’s governor, Lilburn Boggs, ordered them expelled from the state, or “exterminated,” if necessary. Between August and November, 1838, more than 20 Mormons were killed. Over the next year, an estimated 10,000 Mormons were forced to leave the state, most settling in or near what would become the city of Nauvoo, Illinois. In 1839, Smith directed the construction of a second temple in Nauvoo, as well as becoming the mayor of the new town, and commander of the Nauvoo Legion, a large and nearly autonomous branch of the Illinois militia. Publicly, while Smith was teaching religious doctrines, he was also secretly introducing the practice of polygamy among his members, as well as a symbolic Millennial legislature that made him the king. In 1844, Smith ran for President of the United States but, by this time, there were several church members that had begun to question him. The first and only edition of the Nauvoo Expositor, ran an article that claimed Smith was practicing polygamy and that he intended to set himself up as a theocratic king. The assertions, made by a group of Latter Day Saint members, also charged that Smith was a fallen prophet and that he had acquired too much power. Smith, who was then serving as Nauvoo Mayor, responded by destroying the newspaper’s facilities and declaring martial law to corral the local outrage. Smith was then arrested and jailed in Carthage, Iowa on charges of treason. While he was awaiting trail, an armed mob of men with painted faces stormed the jail and shot him and his brother Hyrum to death. Today, Latter Day Saints view Joseph and Hyrum as martyrs. In a series of church sanctioned essays released in October of 2014, the Mormon Church acknowledged for the first time that Smith had between 30 and 40 wives during his time as leader. 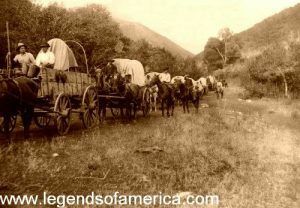 In the spring of 1846, Brigham Young sent out 80 wagons equipped to travel into the Rocky Mountains, where it was rumored that an inland sea, with fertile lands bordering it, awaited their coming, and where they could build up an empire outside of the jurisdiction of the United States. The next year, Young led a large band of Mormons up the Platte Valley, across the plains and mountains to the great Salt Lake in present-day Utah. Other groups soon followed, and the Mormon towns of Florence and Kanesville, which, at their height, had contained long streets that were lined with stores and residences, were practically deserted by 1851-52. The cholera scourge of 1850 followed the Mormons far out on the trail, with many hundreds of them succumbing to its ravages in the first 400 miles of the journey. While the Platte River was the main Mormon Trail to Fort Kearney, Nebraska, second in importance was their use of the original trail from Independence to Fort Kearney, especially by the thousands of Mormons who emigrated from England, and by boats via New Orleans and St. Louis to Independence, or by rail via New York. Migration of the Mormons to the west continued in organized companies along the Mormon Trail until 1869. Afterwards, they came by railroad, continuing the resettlement until 1890. Upon arriving in the Salt Lake Valley, the Mormons publicly announced the practice of plural marriage, which Smith had instituted in secret some years earlier. Plural marriage would become the faith’s most famous characteristic during the 19th century. However, the practice was vigorously opposed elsewhere in the United States, threatening the church’s existence as a legal institution. They also began to build, laying out farms, creating irrigation systems, and constructing homes, churches and schools. The first community established in the Salt lake Valley in 1847 was called Bountiful. The next year, lands were purchased in present-day Ogdon and in 1859, Tooele, Provo and Manti were founded. Fillmore, Utah, intended to be the capitol of the new territory, was established in 1851. Almost immediately, Brigham Young sent out scouting parties to identify and claim additional settlement sites, minerals and other resources. Before long, new settlements were made as far south as Mexico, west into California, north into Idaho and Canada, and east into Wyoming. Missionary efforts led to outposts at Ft. Lemhi, Idaho, Las Vegas, Nevada and Elk Mountain in east central Utah. 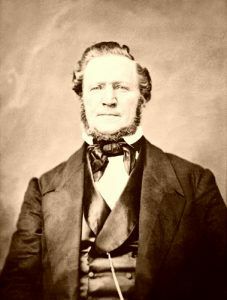 As the colonizer and founder of Salt Lake City, Brigham Young was appointed the territory’s first governor and superintendent of Indian affairs by President Millard Fillmore. Young quickly organized a militia, created Indian missions, directed the building of roads, and established businesses and services to allow the territory to be self-sustaining. However, by the mid 1850’s federal officials received reports that Young was electing only Mormons to become government officials and non-Mormon settlers were frequently complaining of harassment and abuse at the hands of the Latter Day Saints.